Check out my new shirt! 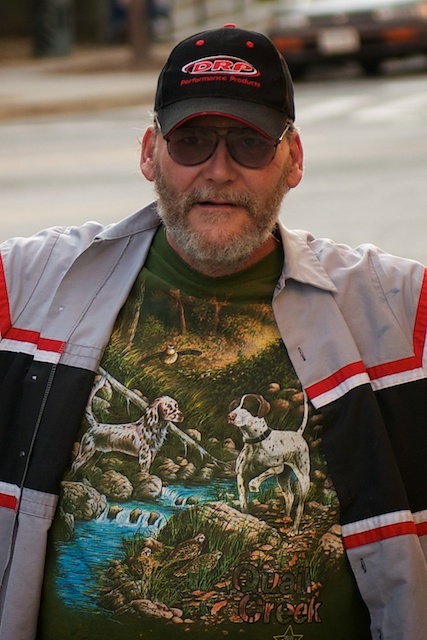 Yesterday as I was wandering around Uptown Martinsville, Virginia with my camera, checking out a new lens I just bought, this guy sees me and says, “Hey, I live uptown, can I help you find some good things to photograph?” I thanked him, explaining I was familiar with the town, and he quickly answers, “Then take my picture with my new shirt”, or words to that effect. So, I did. The guy was happy when I showed him the image on the camera’s LCD, but he complained with a smile that I’d cut his feet off in the frame. I told him I got his best part, and he laughed.